Every wing joint in America has that one notorious sauce that turns up the heat. They feature names like "Blazin", "Inferno", and "Bottled Hell". Each sauce is formulated to cause severe pain for anyone brave enough to to taste them. 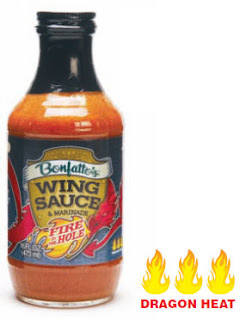 Bonfatto's Fire in the Hole is their signature hot wing sauce. Fire in the Hole adds intense heat to their original wing sauce recipe. 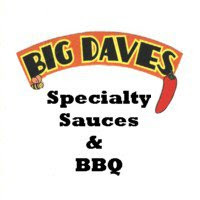 The bright orange sauce combines hot pepper sauce with butter, honey and natural spices to create a traditional Buffalo style flavor. Bonfatto's classifies Fire in the Hole as "Dragon Heat". The burn is definitely intense. There is no doubt that this sauce qualifies as "hot". However, it's not insanely hot like some that I've had. I used Fire in the Hole on smoked chicken wings. It had a tangy burn that caused perspiration on my forehead, but still managed to be enjoyable. It also has a distinct sweetness that is detectable despite the heat. The flavors of Bonfatto's Fire in the Hole are classic and familiar. The heat may be too much for the average person, but chili heads and heat seekers will appreciate the burn. This tasty, tangy sauce works equally well on fried or smoked chicken. Just be sure to use it sparingly. Click here to see Bonfatto's website. See how Fire in the Hole rates on our "Product Reviews" page. 0 Response to "Bonfatto's Fire in the Hole"